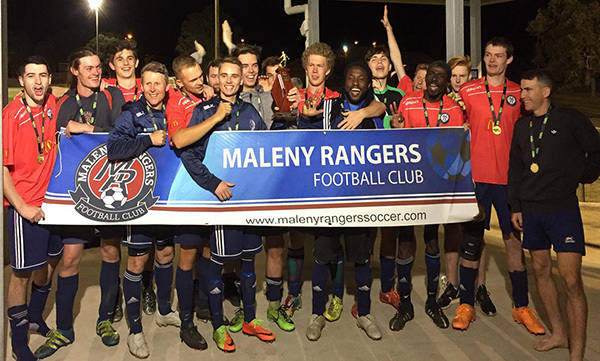 The Maleny Rangers’ men have completed a stellar 12 months winning back-to-back Grand Finals. After winning the 2016 Division 4 Grand Final, the men have triumphed in the Division 3 Grand Final in 2017 in a match that went to penalties and finished after midnight, seeing Maleny Rangers crowned Champions for the second year running. After finishing 4th on the table the Men had to do it the hard way by first winning two elimination finals before progressing to the ultimate game of the season. 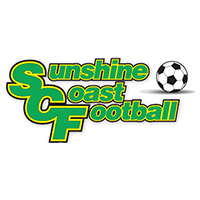 The first semi final was played against 3rd placed Maroochydore resulting in a comfortable 5-2 win. The second semi final against the premiers Noosa finished 2-2 after extra time and it was up to Lachlan White to slot home the winning penalty to win 5-4. 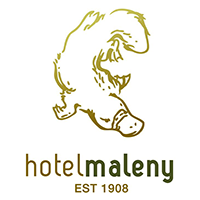 It was great to see a huge turnout of Maleny supporters at the Grand Final on Friday, 8 September. This match against Coolum was played at a typical high intensity on a very small field which didn’t aid Maleny’s usual style of play and hindered their ability to move the ball wide and use their wingers. During the first half, James Lyne was unlucky to have a brilliant volley from distance fended around the post by the Coolum goal keeper. While the Coolum defence held strong, Maleny were able to eventually find their way through the middle of the park with a great goal from Coen Slaughter and went in at half time one goal up. The excitement continued in the second half with both teams having chances, the best falling to Cougar Lutze, whose header rattled the cross bar. At the other end of the pitch, 17 year old goal keeper Hudson Ricks was having a blinder, stifling several Coolum chances. With minutes to go in regular time, Maleny were unlucky to concede a penalty from an unintentional hand ball, from which Coolum sent the game to extra time. Extra time saw few chances for either side however with a minute left on the clock Maleny thought they had a winner after Lachlan White sailed over the defence to head the ball into the back of the net only for the goal to be disallowed for a contentious offside ruling. So for the second week in a row the match was decided on penalties. The second week in a row the Men from Maleny held their nerve to win the shootout. It was left to the youngest member of the team, Cougar Lutze to convert his penalty resulting in jubilant scenes for a club that only won its first ever Senior Grand Final in 2016. The Division 3 competition could not have been much tighter in 2017, reflected by the fact that at one point through the season Maleny Rangers had to play, over a 4 week period, the top team, the second team and then the top team twice; 4 different teams. It was almost a season of “what-ifs” as some matches were lost or drawn by the narrowest of margins despite dominating possession in a lot of these encounters. However the team continued to grow and gel as the season progressed and there was always an underlying confidence that they had the ability to go all the way to the 2nd week in September. A mission accomplished.